iTunes Lost My Library? Two Methods to Fix it! Many iOS users face different kinds of issues associated with iTunes from time to time. One of those issues is the disappearance of the entire iTunes library. iTunes library includes all your media of iDevice, so you will definitely want to recover it. Fortunately, there are several ways to fix the problem when iTunes lost library. You can solve the iTunes lost library problem by replacing it with an old one. The process of solving this issue requires you to perform simple steps like copy, paste, rename, etc. Step 1: First make sure your iTunes software is not opened. If it is, then close it. Step 3: Now navigate to the Previous iTunes Libraries folder on your computer, find the library file and rename it to remove date from its name and then copy it to the folder where you copied the latest one and replace it. Once you are ensured that the replace is successful, copy it to the original location (listed in the second step). Your missing iTunes library will be back after these steps. You can also rebuild your iTunes library by using third-party software called iMyFone TunesMate . It is a powerful iPhone file transfer tool that also offers great iTunes library management features. Using iMyFone TunesMate to recover/rebuild your iTunes library is a recommended choice because it is relatively easier than other methods. Besides, the software wins many positive reviews from online media, such as Getintopc, Geekreply, etc. Transfer media files between your iDevice and computer with high speeds. 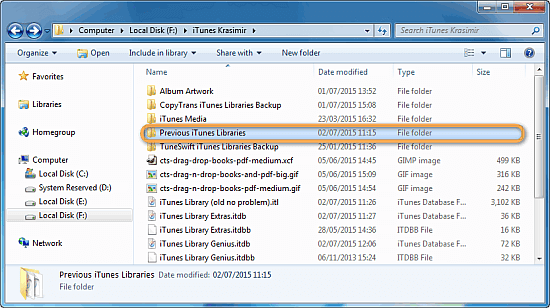 Rebuild/restore your corrupted/damaged iTunes library by using simple steps. Share your entire iTunes library with your friends and family members, even if they are using different Apple IDs. 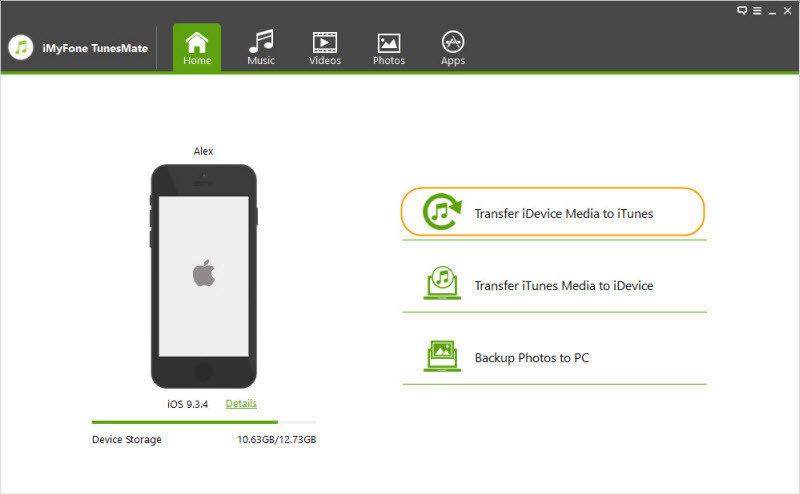 Extract media files from your iDevice directly to MP3 player, external hard drive, USB stick, etc. Step 1: First, install iMyFone TunesMate on your Windows PC or Mac if you haven’t done it already. Step 2: Connect your iDevice to your computer with USB cable. Step 3: Launch iMyFone TunesMate and use Transfer iDevice Media to iTunes option. Step 4: Click on Start button to confirm your action and then select all media types when you are asked to make a selection. 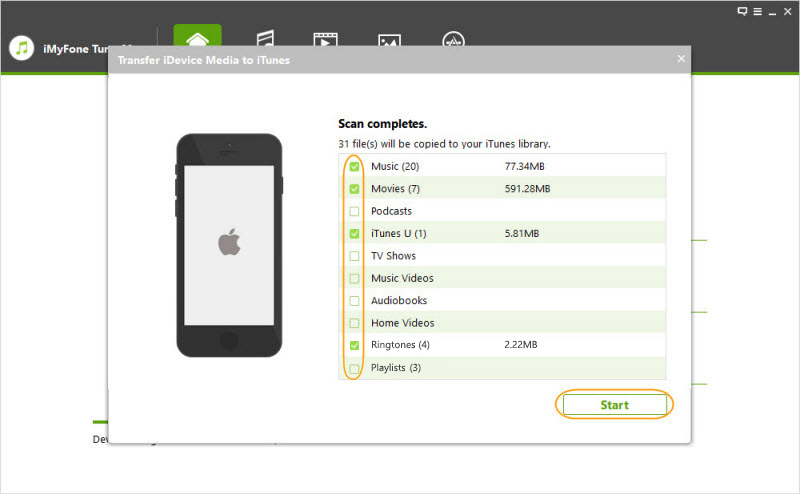 All your iDevice media will be transferred to your iTunes library and in this way your iTunes library will be rebuilt. iTunes upgrade/downgrade; sometimes when updating the iTunes software, the database may get corrupted that will cause the iTunes lost library. The same issue can also occur when downgrading to previous iTunes version. Some users have also stated that this issue occurred after enabling iCloud Music library option in iTunes. iOS upgrade; you may also face the lost iTunes library issue after updating the software of your iDevice. If your playlist has disappeared from your iTunes library, then don’t worry because there is an easy way to recover it. Just make sure you don’t add any new content to the library otherwise the chances of recovering the playlist will diminish. Step 1: First, make sure that the iTunes is closed, if not then quit out of it. Step 2: Now navigate to the iTunes folder on your computer (i.e. 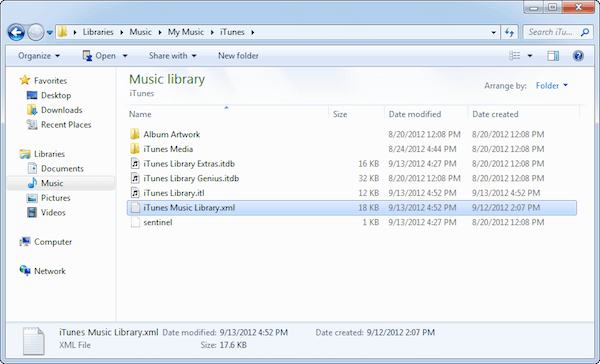 Music/iTunes) and find a file called “iTunes Music Library.xml”. Cut and paste this file to the folder of your choice in your computer. Step 3: Find and delete the file called “iTunes Library.itl”. Step 4: Launch iTunes and click on Import Playlists option located under Library option on the top of the interface. Now browse and select the “iTunes Music Library.xml” that you moved in the second step. Your lost playlist will be recovered after these steps.